The Solomon Eclectus Parrots (Eclectus roratus solomonensis) - also known as Solomon Island Eclectus Parrots - occur naturally throughout the Solomon Islands east of mainland New Guinea and northeast of Australia in the Pacific Ocean; these islands include New Georgia, Malaita, Santa Isabel, Guadalcanal, San Cristobal and Choiseul. They are also native to Bougainville, New Britain, New Ireland, the Admiralty Islands and throughout the Bismark Archipelago. 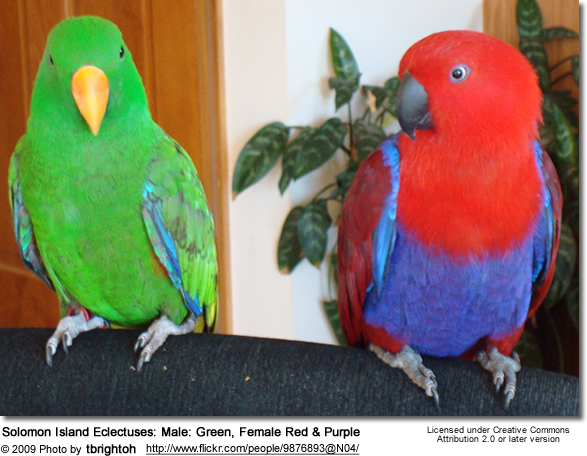 Due to some variation in size, suggestions have been made that some of them should be separated into different species of eclectus; but this requires future research. Throughout their natural range, they are mostly common but they are impacted by deforestation within their range and political unrest on some of these islands. Therefore, their future is uncertain. 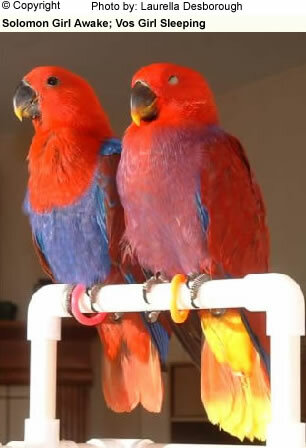 These regal, colorful parrots are also very popular in captivity as pets. At maturity, the Solomon Eclectus averages between 12 and 15 inches (32 - 38 cm) in length and weigh between 13.8 - 15.7 oz (390 - 445 grams). 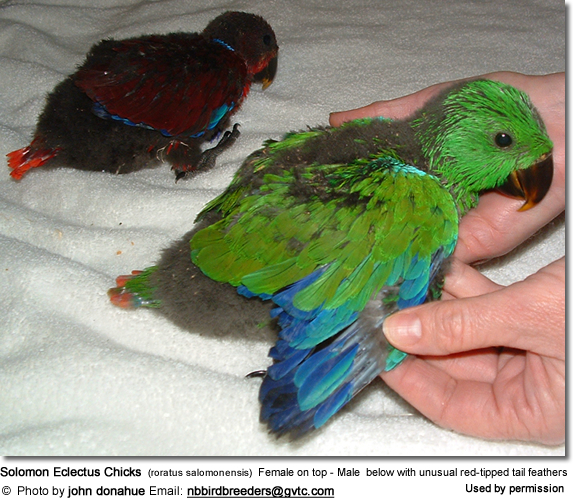 This is one of the two smallest subspecies of Eclectus Parrots. . Male Solomon Eclectus Parrots have yellow-tinted green feathering over the majority of their bodies. 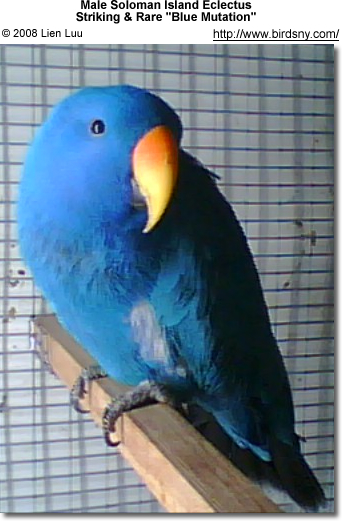 Their primary wing-coverts and primary flight feathers are a dark blue color, edged in green. 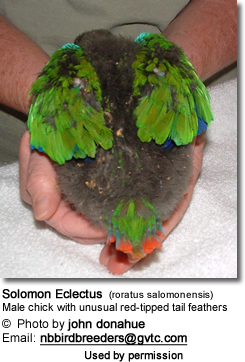 The upper side of the Solomon Eclectus male's tail is green. The underside of the tail is black, edged with a thin band of pale yellow stretching for about ten millimeters. The iris is a reddish orange color. 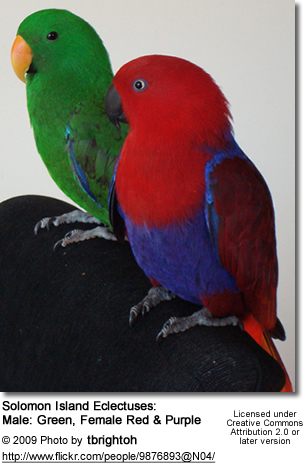 Female Solomon Eclectus Parrots have stunning red plumage with dark blue under-wing coverts. They also have a band running to the nape that is dark blue. 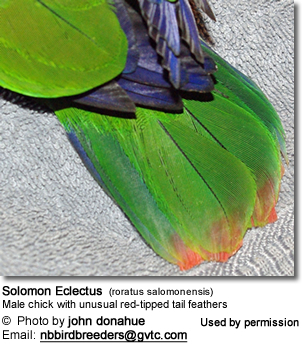 Females have dark blue, green-edged primary coverts and primary flight feathers like the male, as well. Their irises are a light yellow-white color. 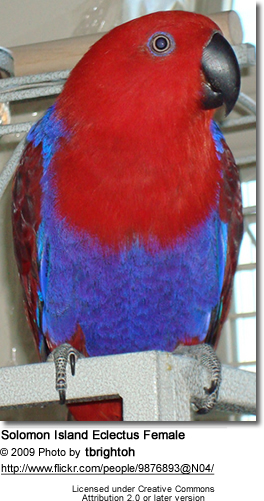 Unlike the hens of other eclectus sub-species, the Solomon female has no visible yellow or orange coloration - only red and blue, with some undercolors of green which are not normally visible.